I could easily make a mile-long list of all the reasons I love the BRNO Chair, but for the sake of brevity, I’ll just focus on versatility. The ongoing question of whether it is an office chair or a dining chair need never be asked again: it is both and even more. These chairs bring a modern element to any room and in combination with their unexpected level of comfort and durability, our BRNO Chair Reproductions offer endless options for which room they can fit and serve a purpose. BRNO Chair in the Office: We offer arm pads as an option on our reproduction and in an office setting, the arm pads are a great way to go. 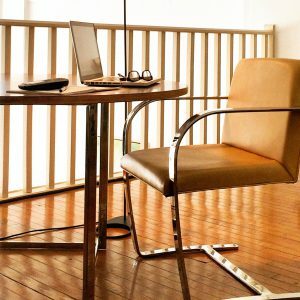 These are typically used as guest chairs or executive chairs in office settings, though you can also find them in lobbies and waiting areas too. BRNO Chair in the Dining Room: You can expect hours of good conversation at your dining table when you are entertaining your guests in these chairs. With how comfortable as the BRNO Chairs are, your guests may never want to leave. Although it seems the arm pads are used more for office settings, there is no rule against using them in the dining room too, so it is entirely up to your personal preference. BRNO Chair in the Bedroom: Perhaps this is not the first place one would visually place this chair but it is actually the exact room the original flat bar Brno Chair was placed in Mies van der Rohe’s Villa Tugendhat. Perfect as a pair of chairs or even a single chair standing alone, it is perfect for that one bare corner or as a late night reading chair. What is your favorite place to see the BRNO Chair? Stop by any of our three showroom locations in Bellingham, Chicago or Dallas and see first hand the beauty and versatility of our BRNO Chair Reproductions!